Fig. 4. Synapse distribution of cerebral motor cortex in AC model. Effects of IC and AC on the number of SSBs and MSBs. (A) Total number of synapses include SSBs with MSBs were significantly increased after AC in cerebral motor cortex layer V (p=0.0016; Student t-test). (B) However, effective changes number of synapses occur in MSBs (SSBs, p=0.4699; MSBs; p<0.0001; Student t-test). (C) Estimation for number of synapses per unit volume (1 μm3) presented same results comparison total number of synapses significantly (SSBs, p=0.4698; MSBs, p<0.0001; Student t-test). 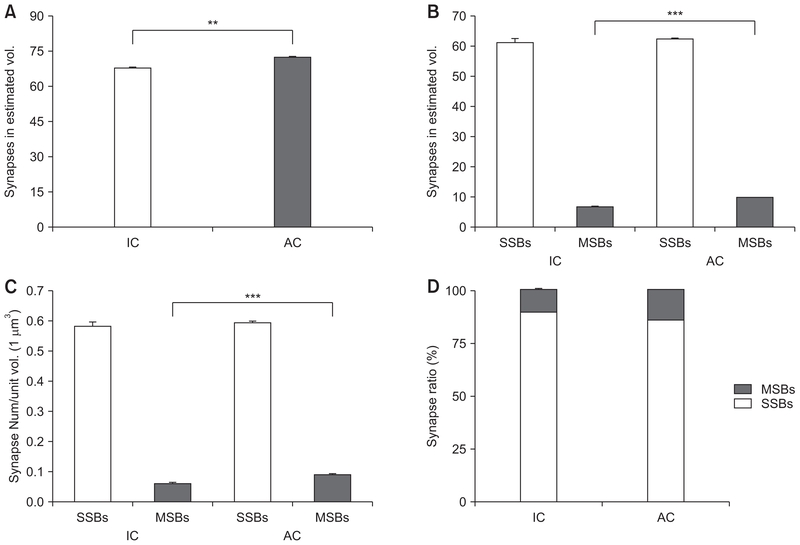 (D) Proportion of SSBs and MSBs were showed similar result between IC and AC. Data are means±SEM.